Islam News Room - Miracles of Hadeeth? What are some of the many miracles related to Muhammad, peace be upon him, so many years back? Description: The seven layers of the earth which scientists have recently discovered was eluded to by Prophet Muhammad 1400 years ago. The Sunnah of Prophet Muhammad, like the Quran, contains scientific information unavailable 1400 years ago. "Hadiths" are "stories" or "narratives" from the Prophet Muhammad, peace be upon him. It was narrated on the authority of Abu Salamah that a dispute arose between him and some other people (about a piece of land). The aforementioned hadith prohibits oppression in general, especially the taking of a piece of land belonging to others unjustly. What are the seven earths they refer to? 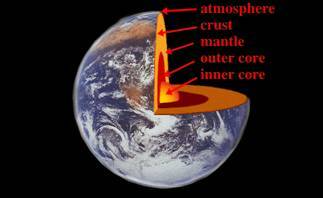 The inner core is solid and unattached to the mantle, suspended in the molten outer core. It is believed to have solidified as a result of pressure-freezing which occurs to most liquids when temperature decreases or pressure increases. The outer core is a hot, electrically conducting liquid within which convective motion occurs. This conductive layer combines with Earth’s rotation to create a dynamo effect that maintains a system of electrical currents known as the Earth’s magnetic field. It is also responsible for the subtle jerking of Earth’s rotation. This layer is not as dense as pure molten iron, which indicates the presence of lighter elements. Scientists suspect that about 10% of the layer is composed of sulfur and/or oxygen because these elements are abundant in the cosmos and dissolve readily in molten iron. (3) The “D” Layer: 3% of Earth’s mass; depth of 2,700 - 2,890 kilometers (1,688 - 1,806 miles)This layer is 200 to 300 kilometers (125 to 188 miles) thick and represents about 4% of the mantle-crust mass. Although it is often identified as part of the lower mantle, seismic discontinuities suggest the “D” layer might differ chemically from the lower mantle lying above it. Scientists theorize that the material either dissolved in the core, or was able to sink through the mantle but not into the core because of its density. The lower mantle contains 72.9% of the mantle-crust mass and is probably composed mainly of silicon, magnesium, and oxygen. It probably also contains some iron, calcium, and aluminum. Scientists make these deductions by assuming the Earth has a similar abundance and proportion of cosmic elements as found in the Sun and primitive meteorites. The transition region or mesosphere (for middle mantle), sometimes called the fertile layer, contains 11.1% of the mantle-crust mass and is the source of basaltic magmas. It also contains calcium, aluminum, and garnet, which is a complex aluminum-bearing silicate mineral. This layer is dense when cold because of the garnet. It is buoyant when hot because these minerals melt easily to form basalt which can then rise through the upper layers as magma. The upper mantle contains 15.3% of the mantle-crust mass. Fragments have been excavated for our observation by eroded mountain belts and volcanic eruptions. Olivine (Mg,Fe)2SiO4 and pyroxene (Mg,Fe)SiO3 have been the primary minerals found in this way. These and other minerals are refractory and crystalline at high temperatures; therefore, most settle out of rising magma, either forming new material or never leaving the mantle. Part of the upper mantle called the asthenosphere might be partially molten. 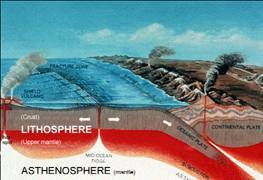 The rigid, outermost layer of the Earth comprising the crust and upper mantle is called the lithosphere. The oceanic crust contains 0.147% of the mantle-crust mass. The majority of the Earth’s crust was made through volcanic activity. The oceanic ridge system, a 40,000-kilometer (25,000 mile) network of volcanoes, generates new oceanic crust at the rate of 17 km3 per year, covering the ocean floor with basalt. Hawaii and Iceland are two examples of the accumulation of basalt piles. 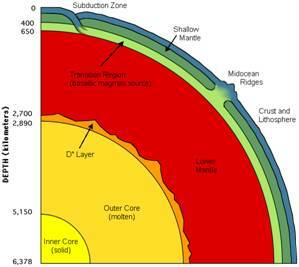 This image shows a cross section through the earth’s crust and upper mantle showing lithosphere plates (made of the crust layer and the top part of the mantle) moving over the asthenosphere (upper mantle). Windows to the Universe, at (http://www.windows.ucar.edu) at the University Corporation for Atmospheric Research (UCAR). ©1995-1999, 2000 The Regents of the University of Michigan; ©2000-05 University Corporation for Atmospheric Research. The continental crust contains 0.554% of the mantle-crust mass. This is the outer part of the Earth composed essentially of crystalline rocks. These are low-density buoyant minerals dominated mostly by quartz (SiO2) and feldspars (metal-poor silicates). The crust (both oceanic and continental) is the surface of the Earth; as such, it is the coldest part of our planet. Because cold rocks deform slowly, we refer to this rigid outer shell as the lithosphere (the rocky or strong layer). This image shows the divisions of the Earth’s interior into 7 layers. The layers of the earth coincide with the above mentioned hadith of the Prophet. (1) The expression of the hadith, ‘He will sink down the seven earths on the Day of Resurrection,’ indicates the stratification of these “earths” around one center. (2) The exact number of heavens, accuracy of the hadith, referred to by Prophet Muhammad, peace be upon him, as the seven inner layers of earth. The only way for a desert dweller to have known these facts 1400 years ago is through some type of revelation from God. Beatty, J. K. and A. Chaikin, eds. The New Solar System. Massachusetts: Sky Publishing, 3rd Edition, 1990. Press, Frank and Raymond Siever. Earth. New York: W. H. Freeman and Company, 1986. Seeds, Michael A. Horizons. Belmont, California: Wadsworth, 1995. El-Najjar, Zaghloul. Treasures In The Sunnah: A Scientific Approach: Cairo, Al-Falah Foundation, 2004. "Did Prophet Muhammad Have Miracles?"